For PIERCE THE VEIL, "Texas Is Forever"
PIERCE THE VEIL fans, the wait is finally over. After nearly 820,000 views of the band's video album announcement posted last Friday, the new album Misadventures will be available for digital pre-orders beginning tonight at 9PM PT/Midnight ET. But wait, there's more: fans will get a first taste of the new music as placing an album pre-order will unlock an instant-grat download of the track, "Texas Is Forever". Go to PierceTheVeil.net for more information and to place your digital pre-order tonight. Pre-order details for the physical CD will be announced soon. Can't wait until tonight to hear the new track? Then check out the band's animated video clip that premieres "Texas Is Forever" below. ""Texas Is Forever" is a fast song, the fastest song we've ever done," said PTV's bass player Jaime Preciado. "It goes back to our roots and is going to be a fun song to play live." Added vocalist Vic Fuentes, ""It's purely a self-indulgent song for us because it's really fast and that's what we grew up listening to. Lyrically, it closes the book on a relationship that I've been singing about over the last three albums." Misadventures is the follow up to the band's breakthrough album, 2012's Collide With The Sky that has sold more than 400,000 copies worldwide. 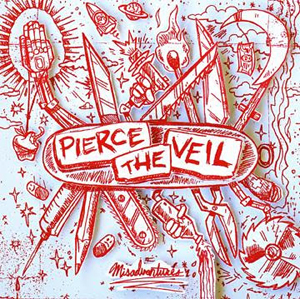 The band - Vic Fuentes/vocals, guitar, Tony Perry/guitar, Jaime Preciado/bass, and Mike Fuentes/drums - recorded Misadventures on and off between Summer 2014 and Summer 2015, working again with producer Dan Korneff who co-produced Collide. On Misadventures, PTV spins together eleven sonic stories driven by a high-energy hard rock soundtrack.